I wasn't sure how stretchy the fabric would be and I did initially expect it to have a much larger stretch percentage like a typical rib fabric does. Because of this, when the fabric arrived I wasn't initially sure about what to make out of it. I often find that rather than rushing into a project (which is tempting when gorgeous fabric arrives in the post!) I much prefer the end result if I think about the design of the garment for a while so that I end up with a finished item which is perfect for both the fabric and what I want to wear. As often is the case, it was my Mum who first came up with the idea for this top. I love mock neck and turtleneck collars and I had initially planned to make a Freya top out of the fabric. Because the fabric is nowhere near stretchy enough to make a Freya, I started to think of different options which could still involve a high neck. My Mum suggested a much wider collar which sat further away from my neck with the top coming into a boxier shape similar to the Linden. While I was still pondering over which pattern I could use/hack, one of my friends came round wearing the perfect jumper. 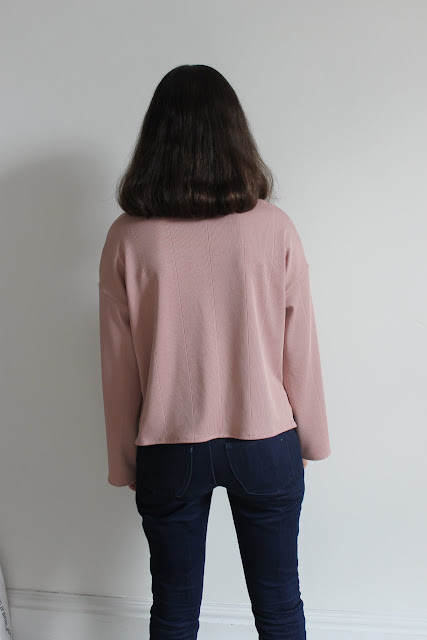 It was exactly the pattern I was looking for and although I can't find the exact jumper on the shop's website anymore, picture a grey knitted version of this top. Of course I immediately asked if I could borrow it to copy and she very kindly leant it to me and it really is the perfect pattern! I've made so many tops and jumpers that the techniques are comfortably familiar. I did want to add another detail to this top though, so I decided to leave the back longer than the front and create a split-hem. This was so simple to do and I love it! It's a really simple detail but I think that it adds a lovely bit of interest to the top. It also means that I'm going to be adding split-hems to a lot more tops in the future! Other than adding the split-hem, I pretty much copied the jumper exactly. I was initially worried about the width of the sleeves which are quite wide. 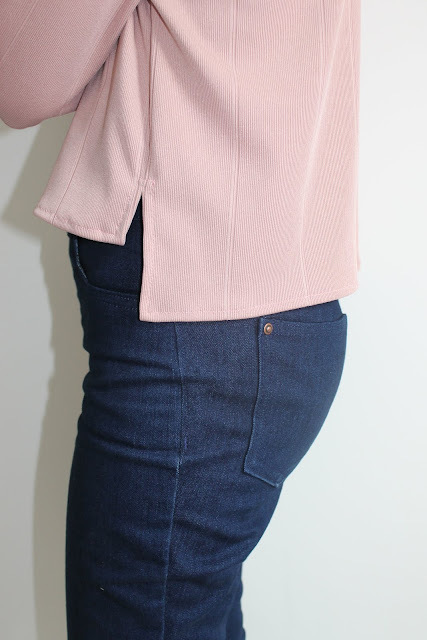 While the width looks great with the heavier knit of the ready-to-wear jumper, I was worried that the medium weight rib fabric would collapse rather than holding the shape and that it would look a bit strange. Expecting to have to take in the sleeves I tried the top on and found that I actually really like the width of the sleeves. I think it works really well with the boxy shape of the top and the drop shoulder. As you've probably guessed by now I absolutely love this top! It's exactly the time of top that I'll wear continuously over the next few months, certainly with a thermal underneath as the temperatures drop! My Mum said she loved it too, which is always the best compliment. Part of the success is definitely the fabric, the drape is so lovely and as it turns out the colour is a winner. This top is so lovely! I love all the details about it. Isn't wonderful to be able to copy something you love? !